Sorry to say, I don’t like to say, but if I don't say, my head will explored into two. What I want to really say is that I really can’t understand why people generally classify vegetarian food as tasteless, boring and unappealing. Help me out here please, please also pardon me if you are one of them who, no matter what, will not or have not tried a pure, true vegetarian delight. Anyway, it’s not for me to decide on the type of food you should pleasure into, neither do I intend to change the mind set of those who have pulled a brake forever to a vegetarian meal. In that regard as well, I am not referring to the countless ordinary vegetarian food you can just walk out and get anywhere these days. 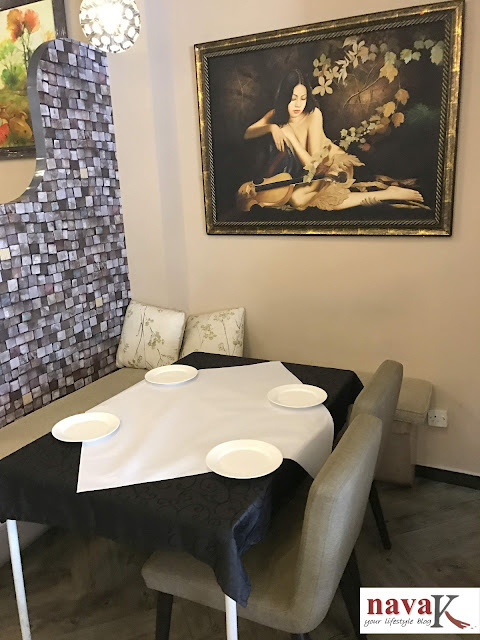 I am certainly referring to fresh vegetarian food, cooked with love and care in an up and running favorable vegetarian restaurant where we, yes, you, me and anyone will be 100% assured that food, drinks and desserts are precisely made from a scratch without artificial flavouring and colouring. Hi there, are you still with me? 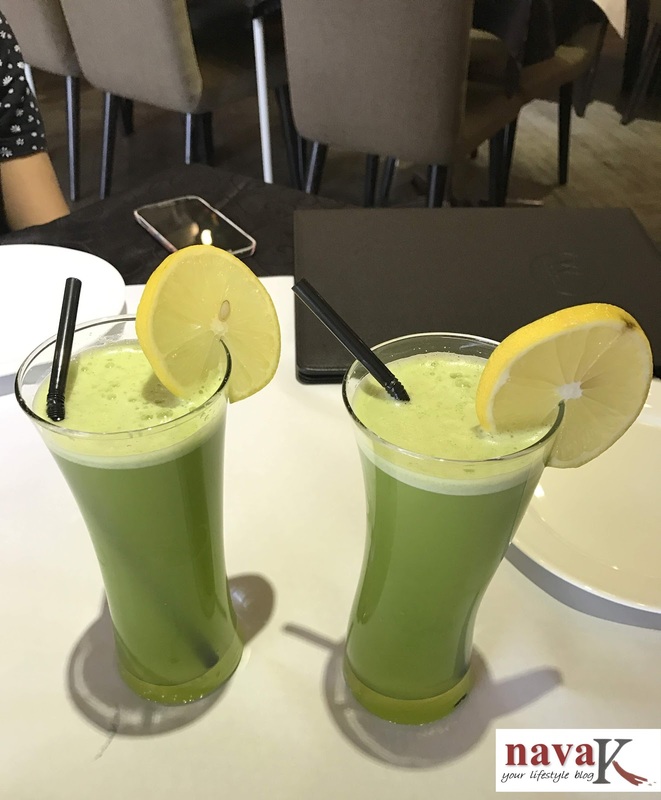 If you are still unsure which restaurant I am particularly talking about albeit I have already given the cue, it is none other except WTF Bangsar. 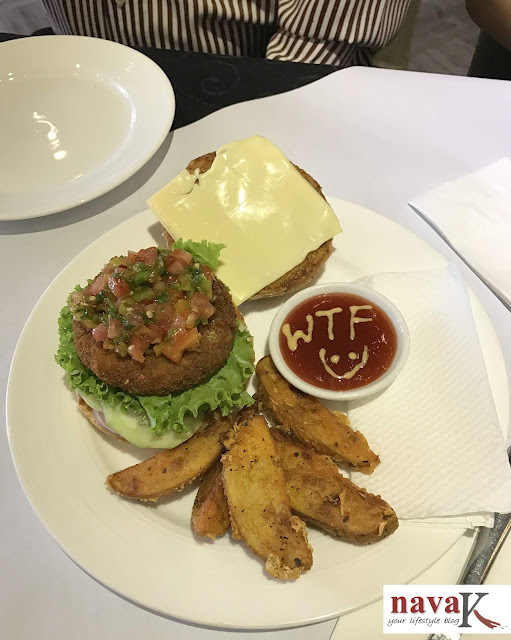 For the vegetarians, I am certain you must have heard or visited WTF once or perhaps a couple of times. 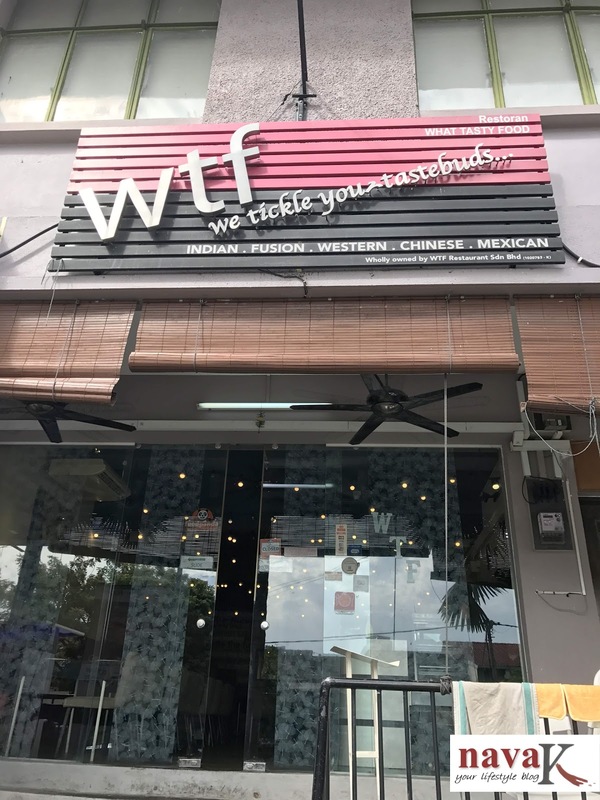 To the rest of you, let me begin by saying that WTF is a reputable vegetarian restaurant, located across the main road of Lorong Maarof, Bangsar Park and has been drawing not only nearby but far and beyond customers into their modern, upscale and traditional atmosphere. Truly a comfort zone, indeed it is, believe me. For this my first time ever WTF dining experience, I was glad that the stream of dishes was already in line. Otherwise, imagine? 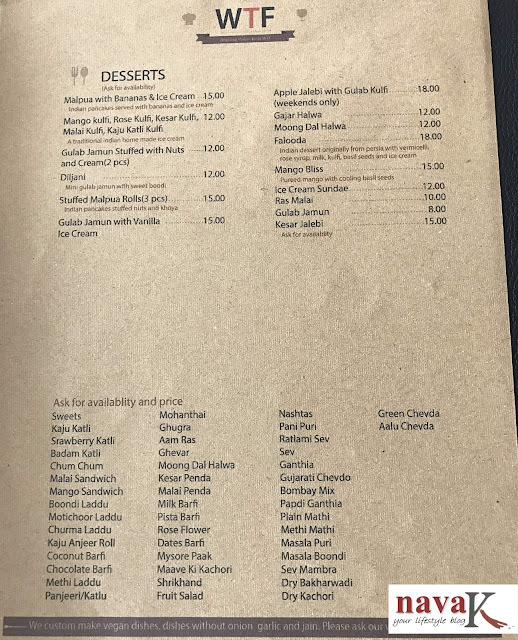 Imagine figuring out which to call for between the huge selections, obviously listed on their menu. All is good. Trust me. It is. 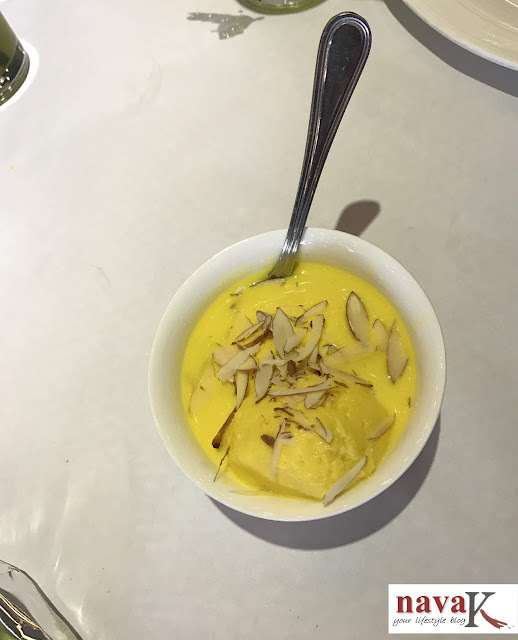 At this juncture I think I should introduce to you the dishes I joyfully devoured in, and then, oh-well, as always, nava-k will speak on the ones she fall in love with. Burger bun home made with zero preservatives. Mexican sauces and patty made of kidney beans and vegetables. 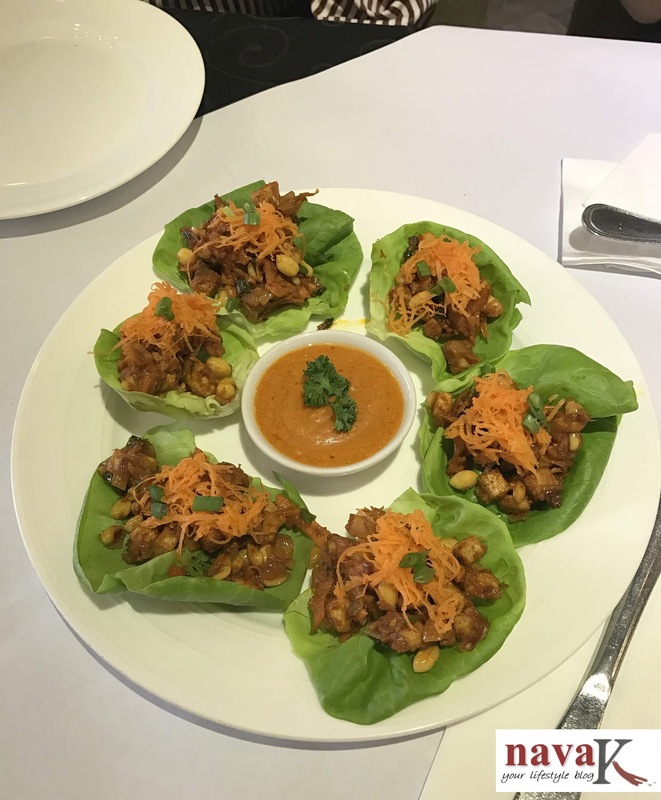 Lettuce leaves topped with a tangy tofu stir fry, alongside a chilli garlic dip. 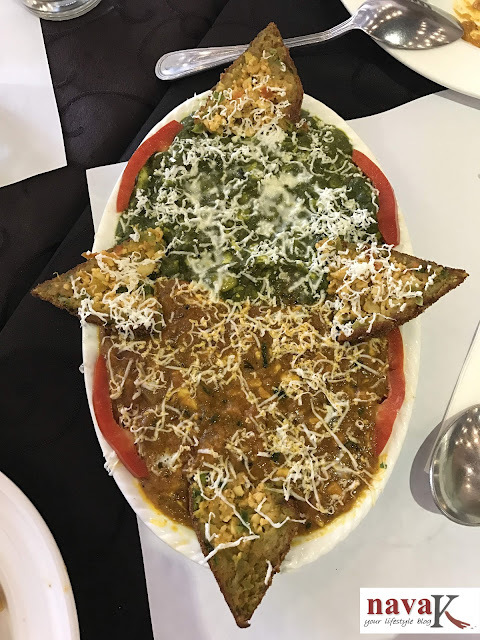 Hung curd seasoned and spiced is stuffed into homemade shells, thereafter deep fried to a crispy goodness. Spinach leaves dipped into a batter and fried, followed by assembling with tomatoes, crispies, date sauce, coriander sauce and yoghurt. Served chilled to be eaten before it turns soggy. Paneer and potato koftas dunked into two sauces - a red sauce and a spinach curry, giving it the name shaam savera - meaning night and day. 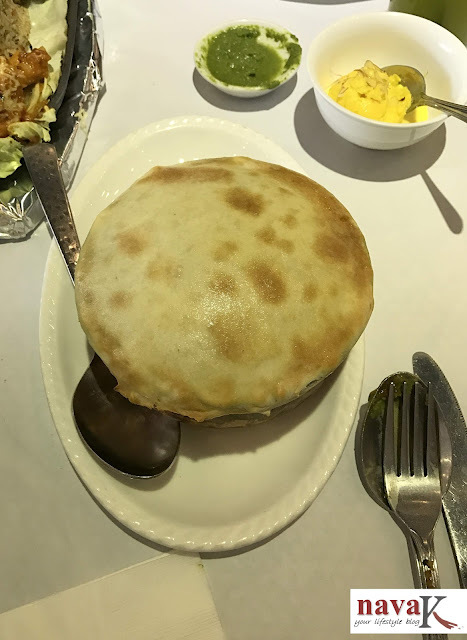 A mix vegetable with light gravy, with a ghunghat (veil) on top which is then placed in the tandoor to bake. This top layer is peeled off and can be eaten as a bread with the vegetable. 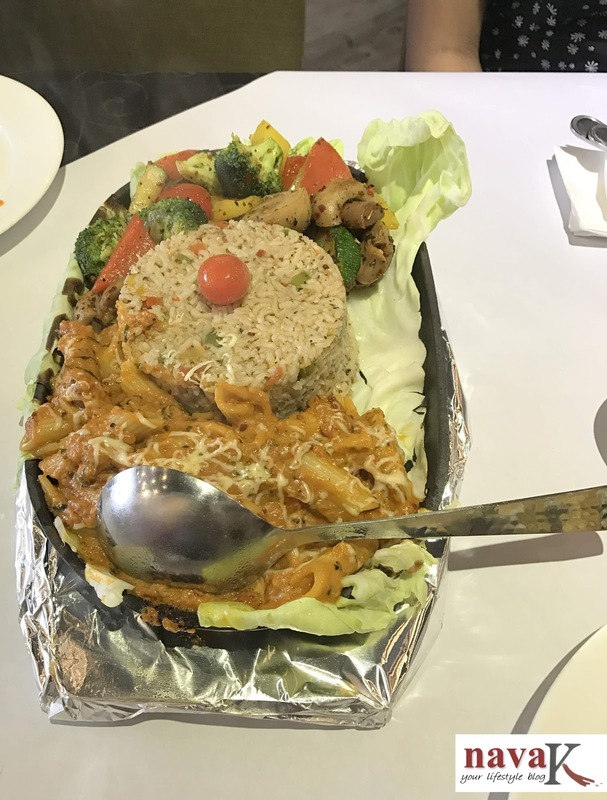 A WTF sauce pasta, herbed rice and grilled vegetables all served on a sizzler plate. 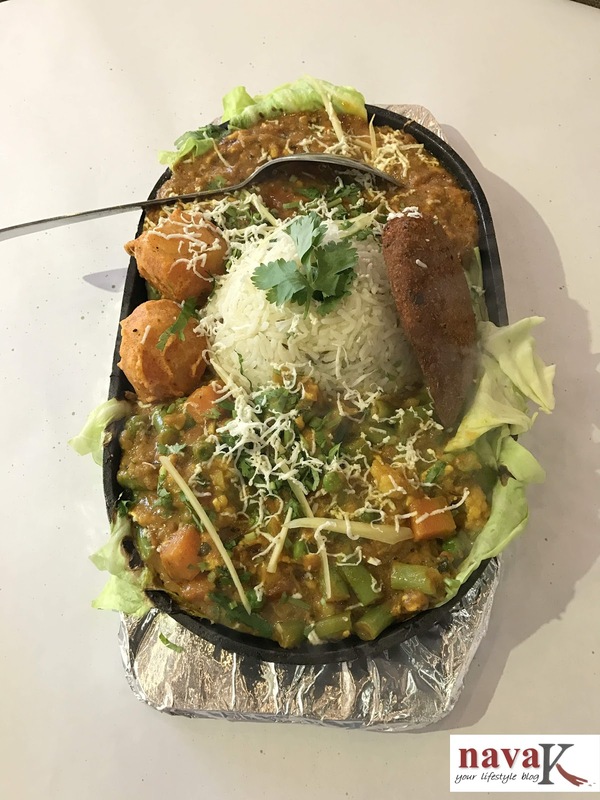 This sizzler has rice, a mix vegetable gravy, a paneer curry and grilled potatoes. 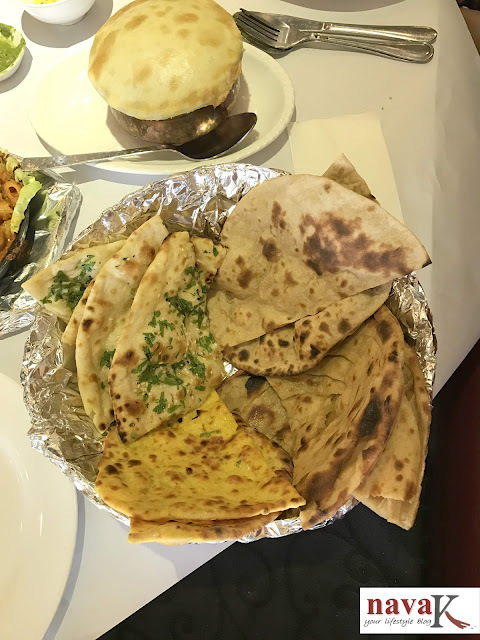 Naan Basket - methi thepla, chilli cheese naan, stuffed kulcha, laccha paratha and garlic naan. Rose Kulfi, Falooda, Rasgulla and Fresh Lime Mint. Each of these items undeniably showcased the philosophy of WTF. Meaning, fresh ingredients, prepared in the niche of time prior to serving and again said, remember, no MSG. Agreed and vouched, but I have to be honest as well. You know right I eat like a bird? So, from those I tasted, I loved the appetizers/starters. Salad Rolls and Dahi Ke Sholay are the crunchy pop in the mouth for tad bit of spiciness and tanginess sensational burst. 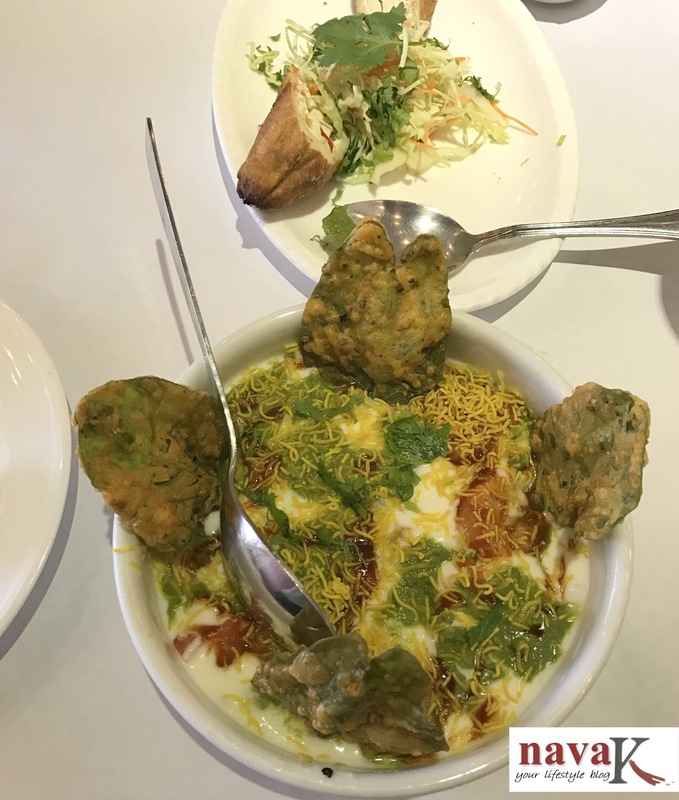 Likewise, Paalak Chaat and Shaam Savera are of similar tastes, but elevated with different ingredients, these two dishes completely captured my heart as I leisurely and gently ate while sipping the apple lime mint goodness. 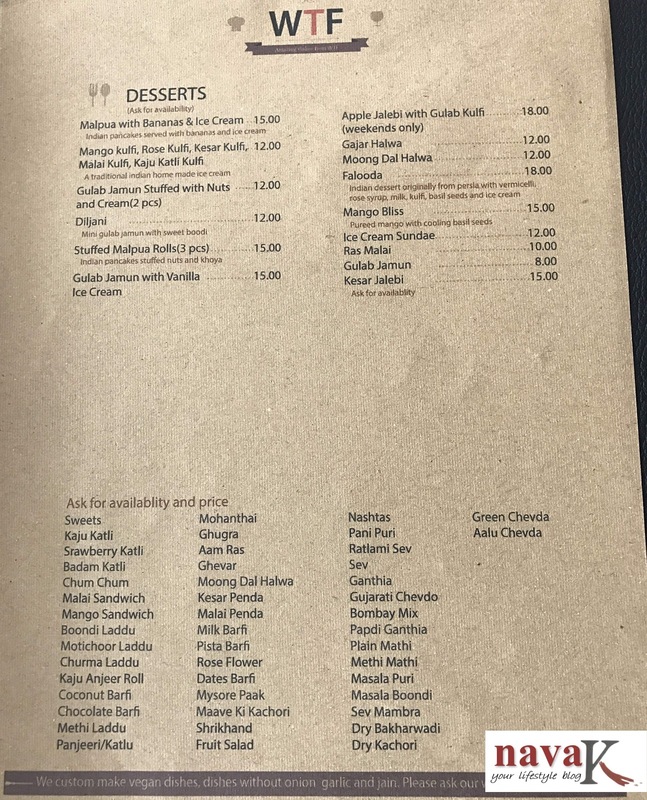 The desserts? Ohlalala!! So true guilty pleasures, but I didn't mind. No, not when I am dining out, all of it divinely super smooth, creamy and awesomely scented. If I am to pick one, please get me the luscious, on-my-love Rose Kulfi. And, to round up this meal, gosh! 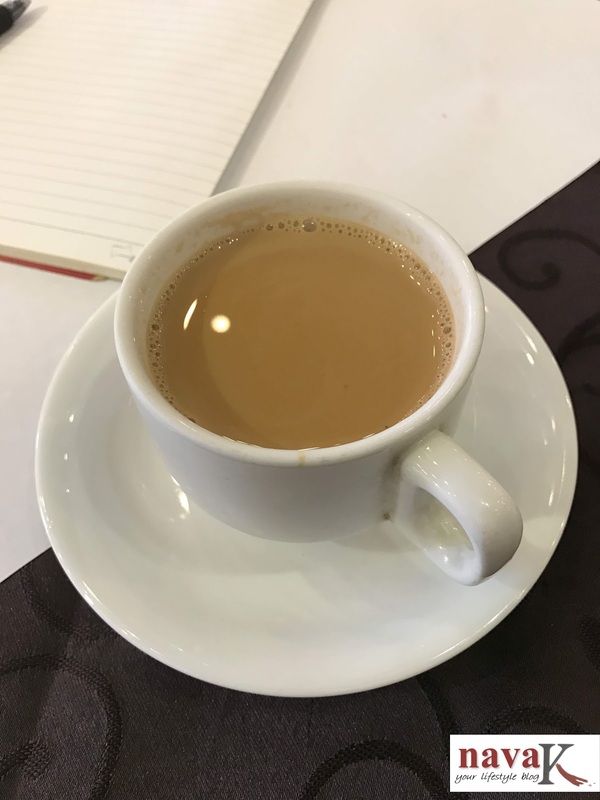 I needed the Masala Chai. I asked for it. Sigh! Thank god the owner didn't mind. Now, you must be wondering what happen to the rest of dishes I hardly touched. Well, they were packed back and dropped at my in-laws. And guess what? My phone wouldn't stop ringing the next day. Sis-in-law kept thanking me because she enjoyed every bit of the "Naan Basket" she ate for the next two days after warming up. My nephew called to say "Aunty Nava (Aunty? grrr!! ), the burger was spicy no doubt, but it was super packed fab. We also loved the wholesomeness of the Tawa Masala Sizzler and Messy Pasta Sizzler. Don't ask me to explain, but definitely caught us by surprise. We really never expected these to be vegetarian food"
So ladies and gentlemen, is there anything more I should speak about WTF? Neh! Make a trip, check it out for yourself and I am confident you will be returning for more. Don't forget yea to trend along "food venture with nava-k" at every other social media please!! 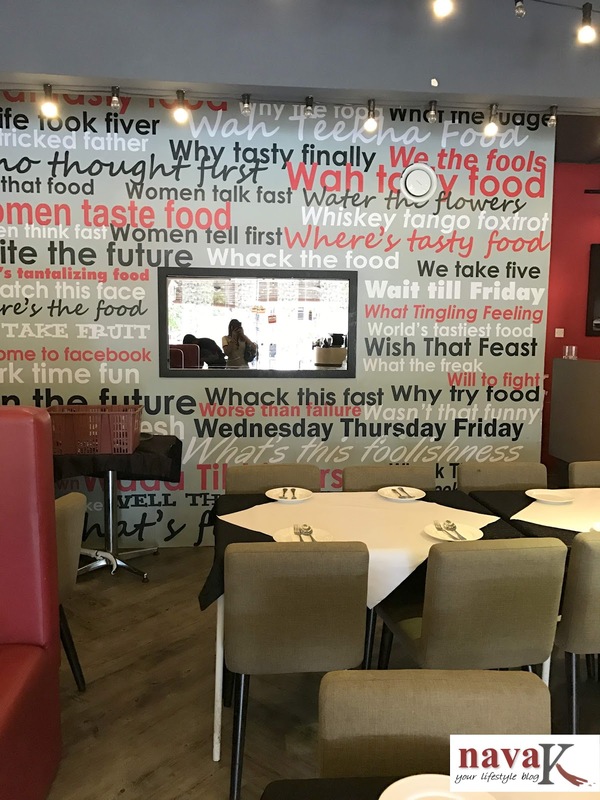 wow I surely would love to visit this restaurant! Gorgeous foods! 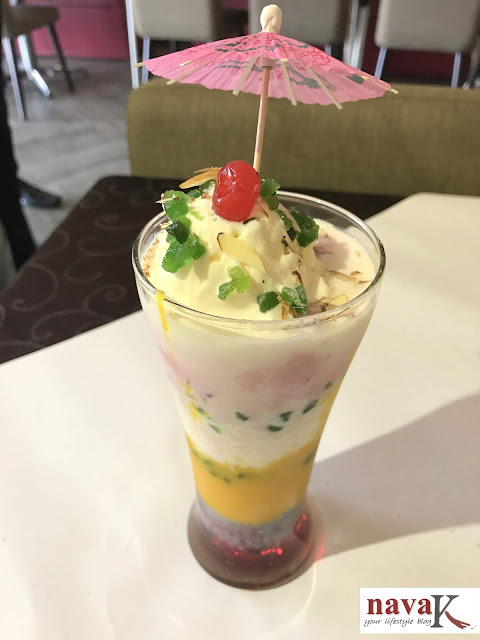 Loved thise dishes and those desserts look yum. If got a chance would have gulped those desserts and licked my fingers. What to do. Milk desserts are my weakness. What a beautiful elegant place! The food looks awesome too! 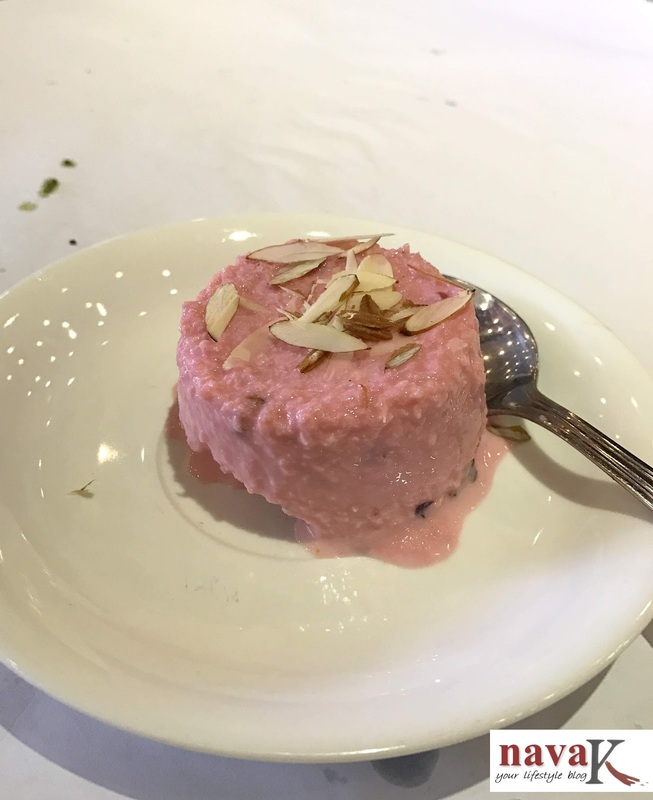 Would love to taste that rose kulfi! 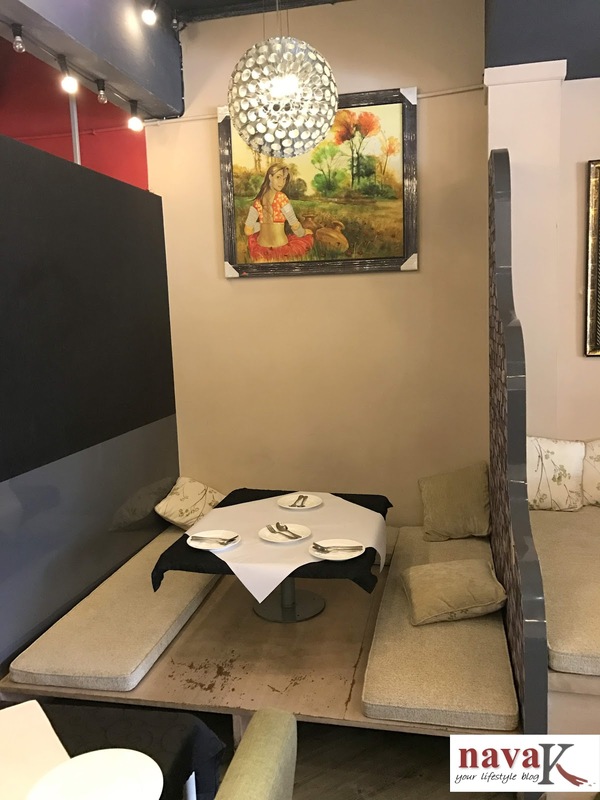 Looking like a superb place for foodies. Hey. Supero super. Please take me here for a Lunch date. I am drooling. Seriously.